Burger fans recognise the power of the special sauce, whipping up their own custom batches to recreate the savoury, delectable bite they know and love from their favourite burger chains. Usually, those sloppy creations mirror thousand island dressing: ketchup and mayonnaise, ketchup, relish and mayonnaise, ketchup, relish, mustard and mayonnaise, et cetera. Except here’s the thing: there’s no ketchup in the most common burger au jus, the McDonald’s Big Mac Sauce. Oil, Vinegar and egg yolks, the core ingredients for mayonnaise, take up positions one, three and four. Relish and its components occupy the two slot. I’m not really worried about the preservatives or thickeners, like potassium sorbet, sodium benzoate, alginate or xanthin gum. So, where on Earth does the savoury tomato-like flavor come from? I asked an expert. “So your telling me this tastes like tomato sauce?” asked Devin G Peterson, director of the Flavor Research and Education Center at The Ohio State University, when I showed him the ingredients. I explained, no, I just always assumed it was thousand Island dressing, which happens to have tomato in it. But then he found something. “This makes sense,” he said. He explained that the hydrolysed proteins on the ingredient list are similar to proteins that have already been digested by your body, which I took to mean proteins broken down into amino acids. Monosodium glutamate—not on the ingredient list—also consists of amino acids, namely, glutamic acid with sodium molecules attached. I googled around and confirmed that Serious Eat’s J. Kenji López-Alt came across this same chemical property while trying to recreate his own burger sauce. To give your own little kitchen experiment that umami flavour, he suggests using a yeast extract like Marmite or Vegemite. 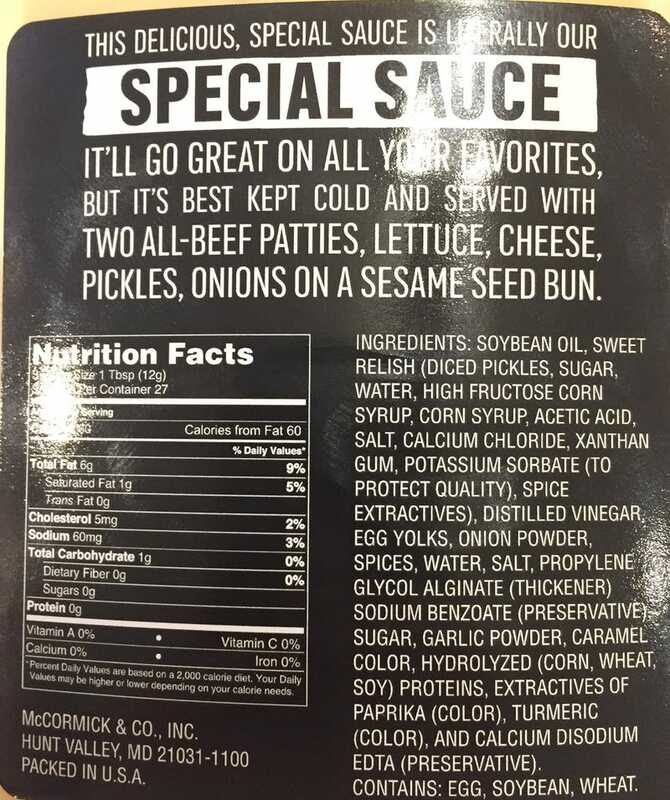 It’s unlikely you’ll get your own bottle of Big Mac Sauce unless you feel like buying number 10,001 at an auction for the Ronald McDonald House Charities today. But if all you want is the flavour, it’s just mayonnaise, relish, some spices (garlic powder and onion powder, though mustard will do) ... and Vegemite.